- but why not try one of these? We’ve said it before and we’ll say it again – nothing is ever diminished by the inclusion of pirates unless of course you’re a 17th century merchant sailing across the Caribbean with a hold full of valuable goods. 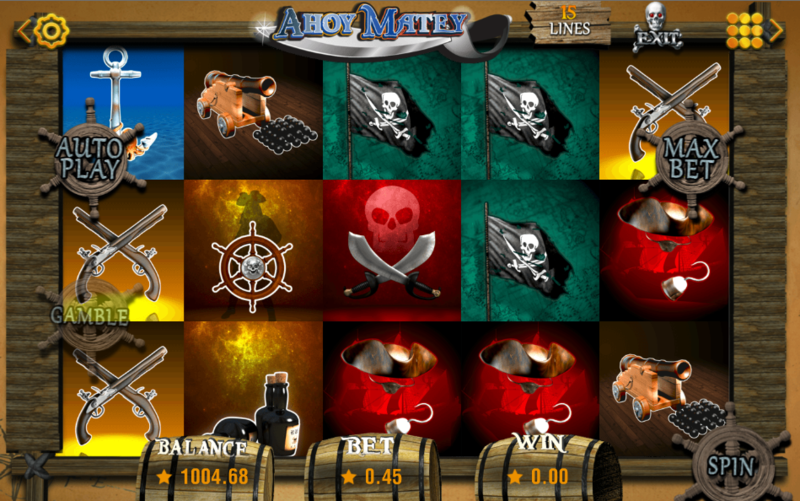 Online slots always benefit from eye patches, cutlasses and Jolly Rogers and here we have one more game to add to the genre; it’s called Ahoy Matey, it’s developed by Booming Games and you can read all about it below. Ahoy Matey is a five reel slot with three rows and up to 15 paylines; those reels spin on a wooden board and the whole thing is set against the backdrop of a pirate ship complete with cannons, ship’s wheel and barrels of gunpowder. The symbols are all related to the theme and include a hat/hook/patch combo, cannon, Jolly Roger, anchor, crossed cutlasses, crossed pistols, bottles of rum and a ship’s wheel. Winning combos can be formed from right to left as well as left to right in this game. The wild symbol is the pirate captain and he will replace all others except the scatter – that’s a treasure chest and it activates the main feature. This round is triggered by landing three or more of the treasure chest scatter symbols anywhere in view; as you can see from the video above you will now receive ten free spins which can be retriggered by landing more scatters. Each base game win can be gambled by clicking the ‘Gamble’ button toward the left of the screen (it won’t work in Autoplay). Pick a gold or silver skull to try and double your winnings but get it wrong and you’ll lose it all. 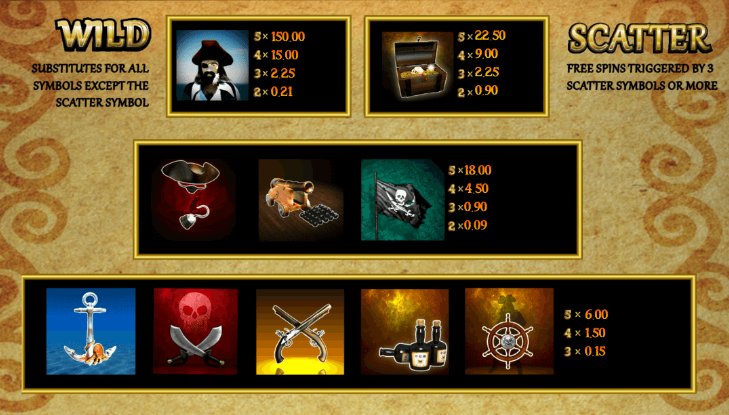 We like Ahoy Matey, it has plenty of high quality, clear symbols and a nice piratey theme. The free spins round seems reasonably easy to trigger and quite profitable when you get there.